By jrosenhouse on August 17, 2016. I know I haven't been around for a while. Sorry about that. A bit of the summer doldrums I guess. But now I have big news to report, for the handful of people who like my chess posts. As big a chess fan as I am, I have been mostly retired from tournament play for a number of years. Sure, I would play in the big team tournament in February, and occasionally I would get the bug and go to the World Open or something like that, but it's been quite a while since I made any serious effort to improve my play. But as I reported previously, some good results in the team tournaments over several years had elevated my rating to the exalted heights of 1968. When your rating reaches 2000 you attain the title of “expert.” With only thirty-two points to go, I decided it was time to hunker down to achieve that little milestone. So I started studying, mostly openings and calculation exercises. And I started playing in tournaments. First up was the Cherry Blossom Classic. I had my ups and downs, but in the end I gained a whopping six rating points to bring me to 1974. Next up was the Continental Class Championship, where I gained eight points and a rating of 1982. Then it was a one day event at the Marshall Chess Club during my recent trip to New York. That one earned me twelve points, for 1996. That's right! Just four more points! The trouble is, once the school year starts, it's very difficult for me to play in tournaments. Though there are plenty of opportunities to do so, it's just too hard to give up a whole weekend for playing chess, let alone to find time to prepare properly. But I really wanted those four points. So I went looking for one more tournament to play in. And that's when I stumbled onto the Washington International, held over the last several days in Rockville, Maryland. Folks, this must be the most magnificent chess tournament I have ever played in. The playing conditions were so good, and the organization so meticulous, I felt like I was being treated like a grandmaster. More on that shortly. So how did it go? Did I get my four rating points? Has the title of this post given things away? I ended up gaining a whopping seven rating points, to bring my rating to 2003. Expert, baby! I have to say, though, I don't feel like an expert. Though I had my moments, overall my play was pretty ragged. Take the first round, for example. My opponent was sporting a rating of 1704. I had white. We started with a Bishop's Opening (though after he played an early d6, it might technically have been considered a Philidor instead.) Whatever you call it, I played a number of highly dubious moves to reach this position, with black about to make his twelfth move. 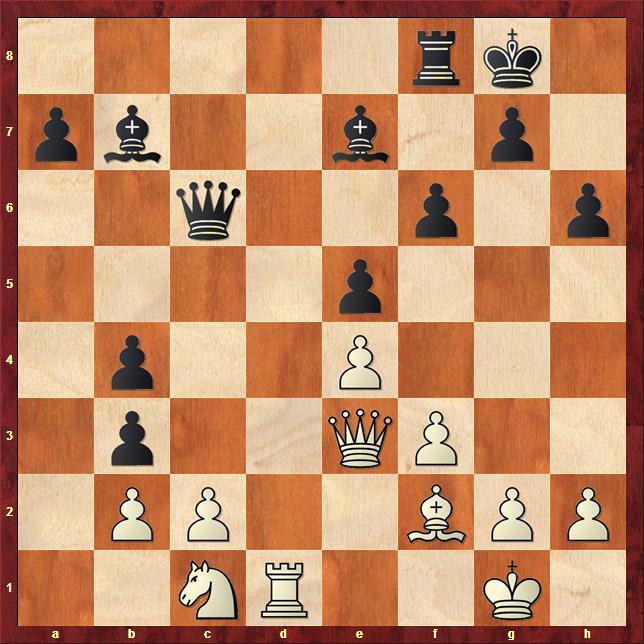 Folks, this is not what white wants twelve moves into a double king pawn opening. My pieces look like they fell from the sky. They certainly do not look like a rational person carefully chose their placements. But white hasn't really blundered a pawn, since the button on d6 is hanging. White has a choice, though. 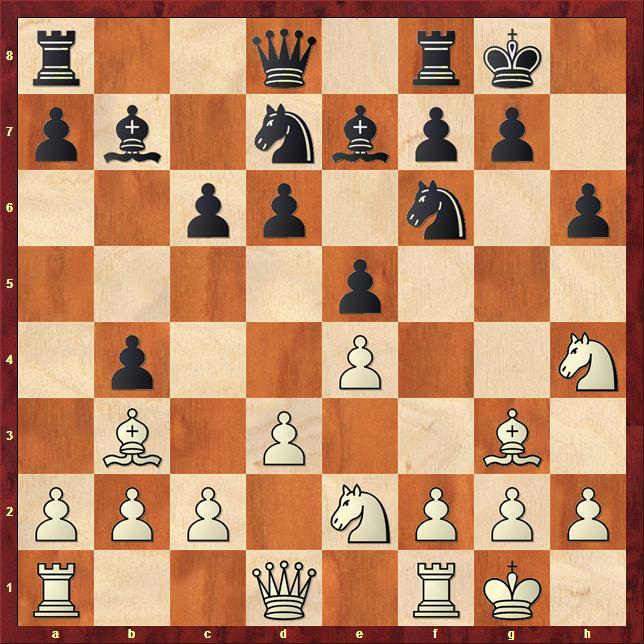 Should he take on d6 immediately, or should he trade bishops on h4 first? I saw that after the moves 14. Bxh4 Qxh4 15. Qxd6, white was going to win a pawn. 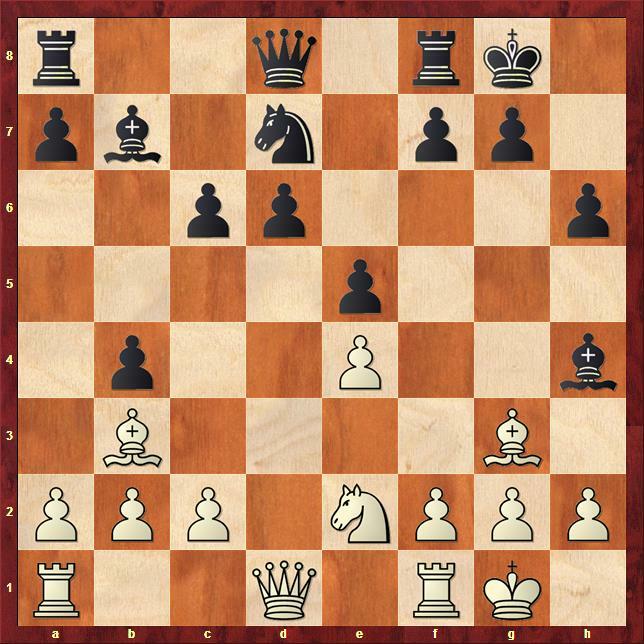 Both the knight on d7 and the pawn on b4 are hanging. But I also calculated some lines where black quickly brings his rooks to the open files that were being created, where his bishop gets active on a6, where I have a problem with the pawn on e4, and where my queen might end up out of play on the queenside. This was all sufficiently scary that I opted for the direct 14. Qxd6. After the retreating moves 14. ... Be7 15. Qd2 play continued like nothing had happened. The computer finds this all very droll. It says big advantage to white after 14. Bxh4. Black's counterplay just never materializes. Looks like all those calculation exercises didn't do me a whole lot of good. Whatever. The next diagram shows the position with black about to play his twentieth move. I was getting pretty glum about my position, for good reason. Black can now win an exchange with the creative 20. ... Bg5 21. Qc5 Bd2. Happily, for me at least, he missed this possibility and played 20. ... c5 instead. Black had just traded his c pawn for my pawn on b3. This was the first bit of encouragement I had had all game. Black missed that he just blundered a pawn to 27. Qxb3+ Kh7 28. Bxa7. Yay me! This would have been a good time for black to take a deep breath though, since he still has the better position. 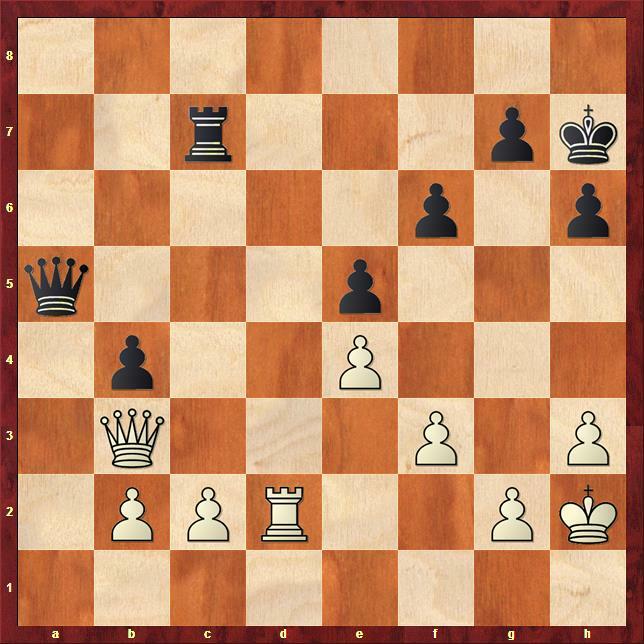 Basically, the white pawn on c2 is doomed. Black can move his rook to c8, and then get his light-squared bishop into the game with Ba6-b5-a4. He will get his pawn back and retain all kinds of activity. But I think this oversight took the wind out of my opponent's sails, since after playing a good game up to this point he now unleashed a series of bad moves. He allowed the trade of his good minor pieces for my bad ones with 28. ... Bc5+ 29. Bxc5 Qxc5+ 30. Kh1 Ba6 31. Nd3 Bxd3 32. Qxd3. Black's position has now lost most of its dynamism, and he is simply down a pawn. After some piece shuffling, we arrived at this position, with black to play his thirty-eighth move. Is white winning? Probably not. The computer gives white only a small advantage. 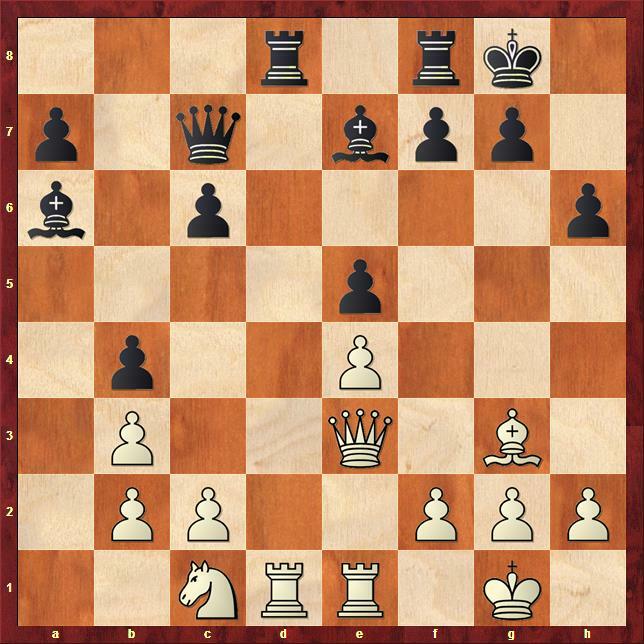 Black does have to be careful though, since in addition to my extra pawn he has to worry about maneuvers like, say, Qe6-f5. I was certainly going to make him suffer for a while. No way I was agreeing to a draw until I had tried everything. But it didn't come to that. You see, black had just over a minute left to make his next three moves (which would bring us to the time control on move forty). Moreover, the game was played with a thirty second increment, meaning that after each move thirty seconds were added to your clock. Now, black can make just about any reasonable queen move here. Qb6 looks fine, as does Qc5. So I figured my opponent would have no trouble reaching move forty. But I was wrong. My opponent got absorbed in the position and simply forgot about his clock. He ran out of time. Game over! So I got the win after all, even if my play left a lot to be desired. Interestingly, beating someone roughly three hundred rating points lower than you nets you...wait for it...four points! I almost withdrew from the tournament right then. Well, I never thought I'd get to call Jason out on a maths error! - but wait a minute. If your first five points were added to a total of “the exalted heights of 1968”, then how did we arrive at “a whopping five rating points to bring me to 1974”? Unfortunately this could be significant, as you ended up on exactly 2000! Is there a compensatory error elsewhere to rescue this situation, or is the sad truth that you are actually rated at 1999 points (perhaps without even having realised this?) I do hope it’s the former. On 2nd thoughts, perhaps you dropped this in as a deliberate error, just to check if we're paying attention? Good catch! Of course, I meant six points, not five points. The other numbers are correct. Looks like you could be Donald Trump's new lawyer. Phew, what a relief ! I've missed your blog a lot, and have been jonesing hard for a POTW. Congratulations, Jason! In my opinion you are clearly deserving of the Expert title. I look forward to the rest of your tournament story. Looking at some of the pictures on the website, it would appear that they provided ACTUAL chessboards?? Maybe clocks as well? Never heard of such a thing. The player who finished 43rd in your section certainly caught my eye. A 1314 player winning 3 games in such a much-higher-rated field? I'm guessing young. Looking forward eagerly to your continuation. Welcome back and congratulations! A good summer for indoor sports, given the August DC weather exceeded everyone's (negative) expectations. How's Emily and, uh, the other one? Thanks! It's certainly very satisfying, even if I did sort of limp over the finish line. The tournament not only provided all equipment, both sets and clocks, but even gave us beautiful wooden sets and boards to play on. Added to the spacious playing room, you understand why I said this was such a magnificent tournament! There were, indeed, many kids at the event. Many of them were higher rated than me! Emily and Spider are both doing fine, though I sometimes worry they are going to forget who I am since I have been travelling so much. Spider has gotten friendly with my cat sitter, since he sees so much of him!